Boneless lamb shoulder roast with crushed kipflers. NO LONGER is winter coming, it's well and truly here, but shorter days and chilly weather shouldn't stop you from coming together with loved ones - and regardless of the occasion, there's a lamb roasting cut perfect for bringing everyone to the table. Here are two hearty and delicious recipes that are guaranteed to warm you up from the inside out. Preheat oven to 180C. To prepare the boneless lamb shoulder, place oil, spices, garlic with herbs in a large bowl and stir to combine. Add lamb and using your hands, rub well to coat. Transfer lamb to a large roasting pan with a roasting rack. Pour any excess marinade left in bowl over the lamb and season liberally with salt and pepper. Roast for 1½ hours or until cooked through to your liking. Rest for 10 minutes before carving to serve. Lamb mini roast with dukkah and roast vegetable salad. Preheat oven to 220C or 200C fan forced. Line a large baking tray with baking paper. Place vegetables in a single layer on prepared tray, drizzle with olive oil and season with freshly ground black pepper. Roast for 35-40 minutes, or until vegetables are tender. Meanwhile, brush lamb with olive oil. Heat a large non-stick frying pan over a high heat. 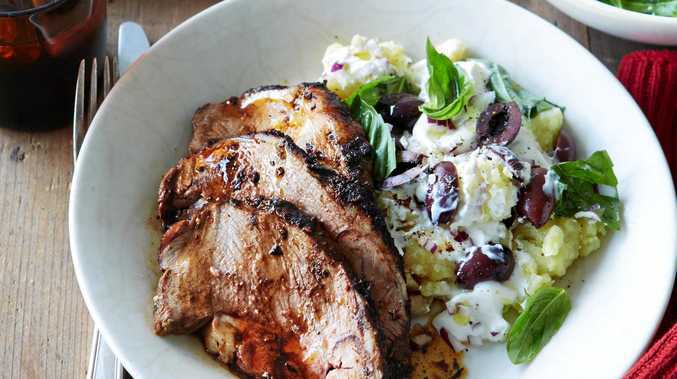 Cook lamb, for 1-2 minutes each side or until browned. Transfer lamb to a rack over a roasting dish. Spread 2 teaspoons of the tahini over each lamb rump, and then sprinkle evenly with the dukkah. Roast for 15-20 minutes for medium, or until 65C on a meat thermometer. Remove, cover loosely with foil and set aside to rest for 10 minutes. Combine yogurt, remaining tahini and lemon juice. 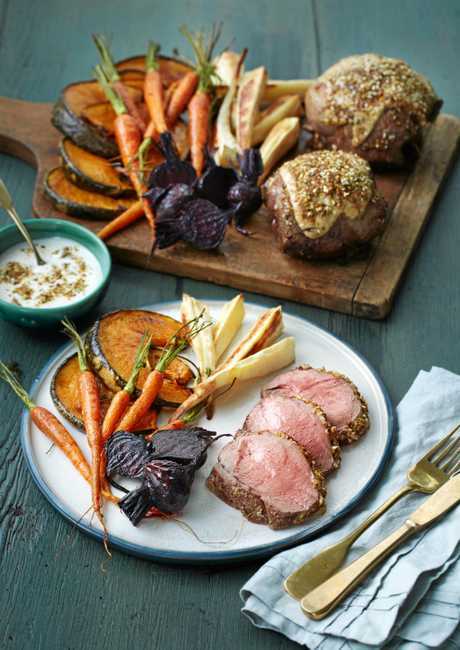 Cut the lamb across the grain into slices of even thickness Divide lamb and roasted vegetables between plates, serve with the tahini yogurt.